Encino is an enclave of the San Fernando Valley filled with peaceful blocks of beautiful homes and high-rise apartments. The district is notorious for being mentioned in Frank Zappa’s “Valley Girl”, a top 40 hit in the 80s. Much like the song, this upper-middle-class neighborhood has managed to maintain its historic appeal. 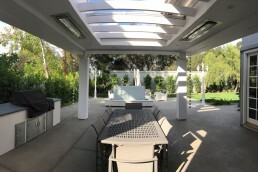 Living in an upscale urban retreat overflowing with LA charm, these homeowners designed a contemporary house with an equally stylish but functional backyard designed by Greydiantscape Architecture Inc. Beyond the French doors, is a four-post structure that houses their outdoor kitchen and dining area. Recessed lights, two patio heaters and a striking water feature adorn the space. However, it is the skylight in the roof that is the main star of the show, providing much-needed light into the space. This unique feature also proved to be the main problem. From dawn to dusk the homeowners had to contend with the harsh rays of the sun. They quickly realized the need for a versatile shade solution. 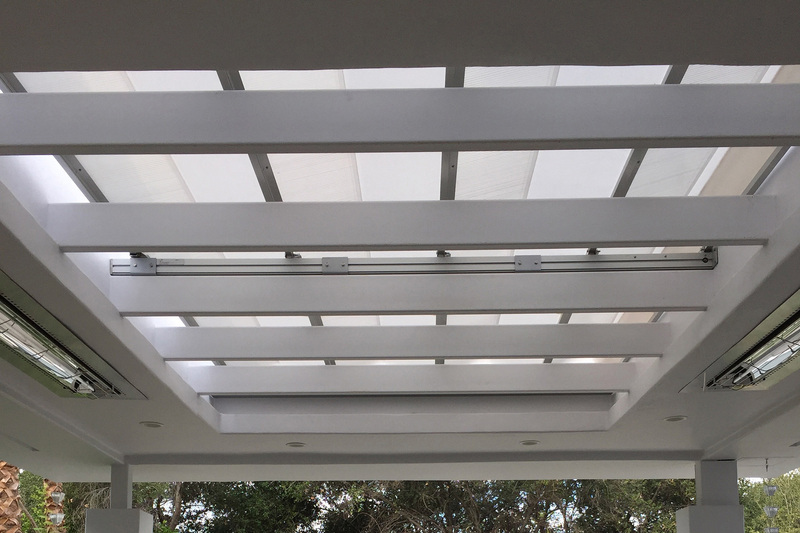 One that could accommodate the unique opening in their roof, while providing full UV protection. 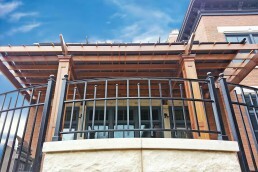 ShadeFX’s retractable products are 100% customizable. Therefore, they are made to fit any space. 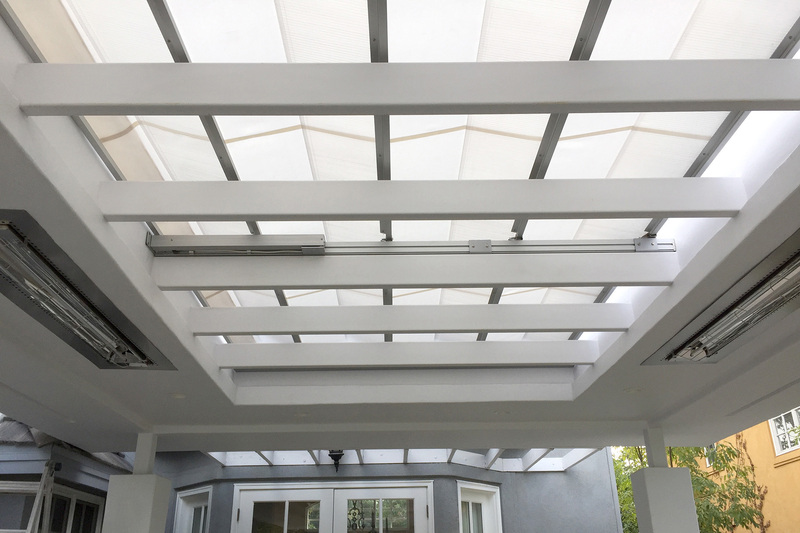 Retractable shades also provide that sense of openness with the ability to give complete coverage when desired. 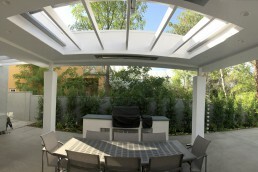 Working with Greydiantscape, ShadeFX customized an 8’x12’ motorized retractable roof for the area. 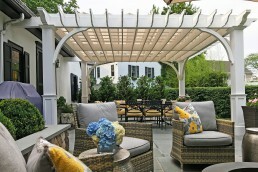 The homeowners chose Sunbrella Natural fabric because of its high UV protection rating. The color of the fabric also beautifully complements the white and grey structure. 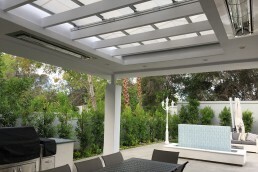 At the press of a button, the homeowners can take cover from damaging UV rays or the occasional afternoon shower. 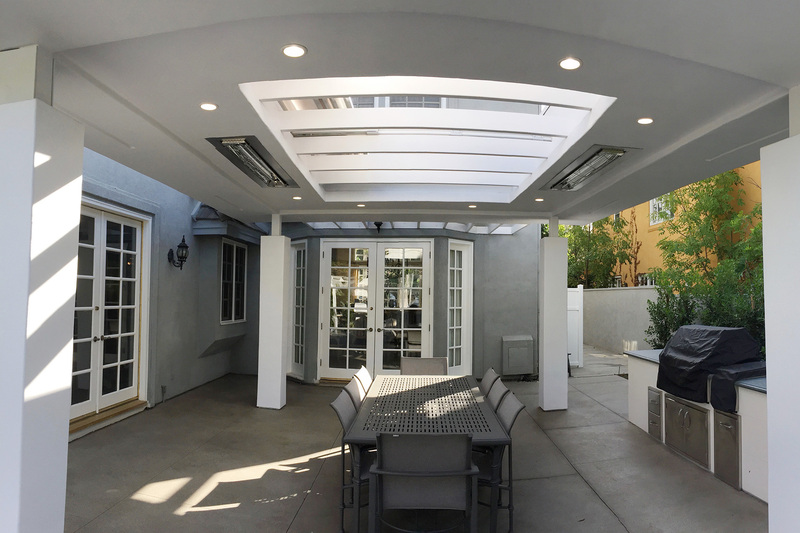 “Working with ShadeFX on the “O” Pavilion in Encino was a pivotal design choice. 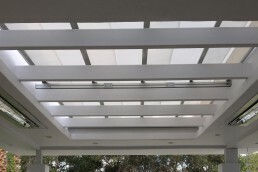 Their sleek, automatic retractable roof added to the overall design and was practical to use. 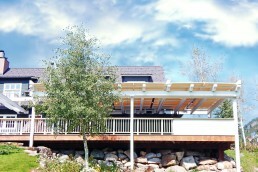 Ultimately, the shade helped the pavilion further respond to the site conditions. 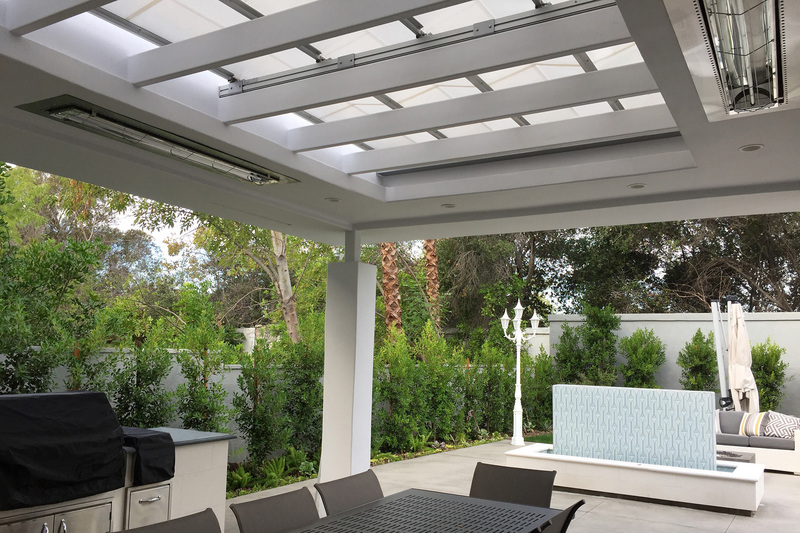 – Chiedu Chijindu, AIA, Principal Architect, Greydiantscape Architecture Inc.
As a result, this outdoor area is now the perfect place where the family can hang out from breakfast to dinner. Come night time they can open the space to let the stars shine in. Have a custom area to cover? Let us help. Working with Greydiantscape Architecture Inc., ShadeFX customized an 8’x12’ motorized retractable roof for the outdoor dining area. 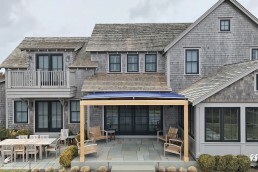 The homeowners chose Sunbrella Natural fabric because of its high UV protection rating. The color of the fabric also beautifully complements the white and grey structure.